One of my favorite cookbooks on the shelf is Molly Stevens’s All About Braising. Her recipe for “World’s Best Braised Green Cabbage” is AWESOME. My adapted Whole30-friendly version of this braised cabbage recipe is a mainstay in my veggie side dish arsenal because it transforms a lowly humble vegetable into a dish worth oohing and aahing over. Yes, it takes 2.5 hours from start to finish, but the total prep time is only ~10-15 minutes. Plus, this braised cabbage side dish makes your house smell so dang yummy. 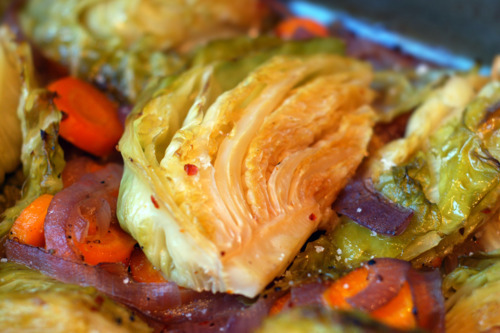 Molly Steven's recipe for the World's Best Braised Cabbage, is an amazing Whole30-friendly vegetable side dish that makes the lowly cabbage a star in its own right. It reheats great so make it ahead! Preheat oven to 325°F with the rack in the middle. Coat a 13-by-9-inch baking dish with the olive oil or melted fat. Lop off the tough stem end of the cabbage and divide it into 6-8 wedges. Keep the core attached so the wedges stay intact after the long cooking time. Don’t worry: The tough core will get super tender, too. 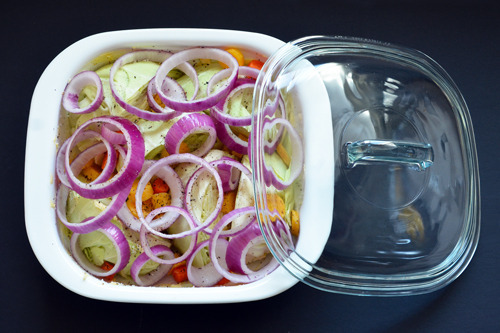 Place the cabbage pieces in a single layer in the greased dish – a little overlap is okay. Toss on the onions and carrots and drizzle with broth and the melted fat. Season well with salt, pepper and Aleppo pepper (if using). Cover tightly with foil and place in the oven. Cook the cabbage undisturbed for 1 hour. Crack open the foil cover and carefully flip the wedges over. Reseal the dish tightly and braise for another hour or until fork-tender. At this point, you can remove the cabbage to cool and store in the fridge until you’re ready to eat it (up to 4 days). When you’re ready to serve, crank the oven up to 425 F and bake until browned (about 15 minutes). Drizzle with aged balsamic vinegar and serve immediately.